The Basics About Writing Letters: Formal or Informal? Copywriters and content writers write dozens of letters (here are 7 of the most common kinds of letters that copywriters write) -- but what kind of letter will work best for a specific situation? You can figure out whether your letter should be formal or informal when you look at why you're writing it in the first place. But first, is there any benefit to writing letters in the first place? Clarity. Writing a letter requires you to think carefully about what you wish to communicate and then put it down clearly. Documentation. When it comes to comparing communicating by print or by telephone, a letter (and its electronic cousin, the email) provide a permanent record of communication. Unless a phone call is tape recorded, you have no physical record of its content. Further, the printed record of a letter gives you the opportunity to review your content and also provides legal documentation when necessary. Gravity. A letter communicates more serious intent over other mediums. 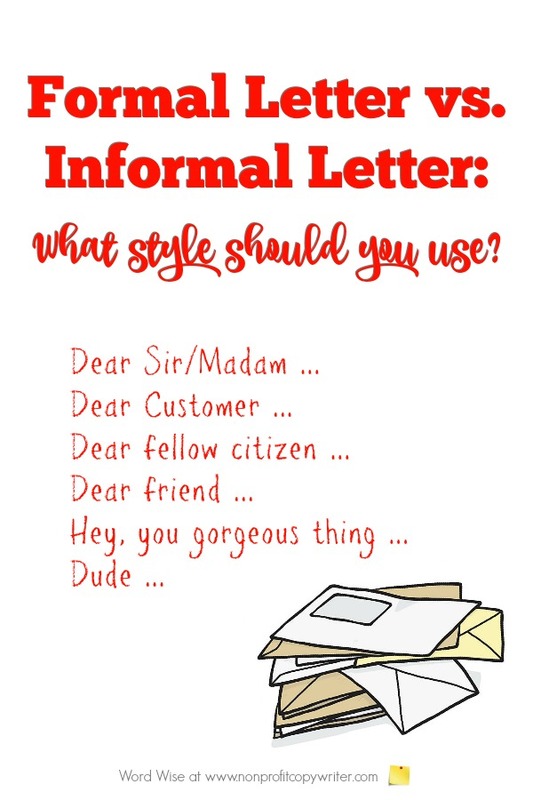 Formal or Informal: Which Should You Choose for Your Letter? A letter is written correspondence from one person or organization to another. It can take a formal approach or an informal approach. To decide which style is appropriate for your letter, identify your audience and the point of your letter. You have three options: you can send a printed letter, an email, or a handwritten note. The medium you choose for your letter follows the degree of formality.